When I slipped into the shotgun seat of my friend’s new black luxury sedan, I could not have imagined the wild ride that would ensue. But as soon as Osman Dibirmagomedov turned the ignition and revved the engine, I felt there was a real possibility I wouldn’t make it out alive. I thought we were headed straight to a wedding in Makhachkala. But as we tore down the local roads in stunts NASCAR drivers only dream of, I learned I would be accompanying the wedding party, which consisted of the groom and his close circle of male relatives. In the West, the groom and his groomsmen don tuxedos and take photos together. 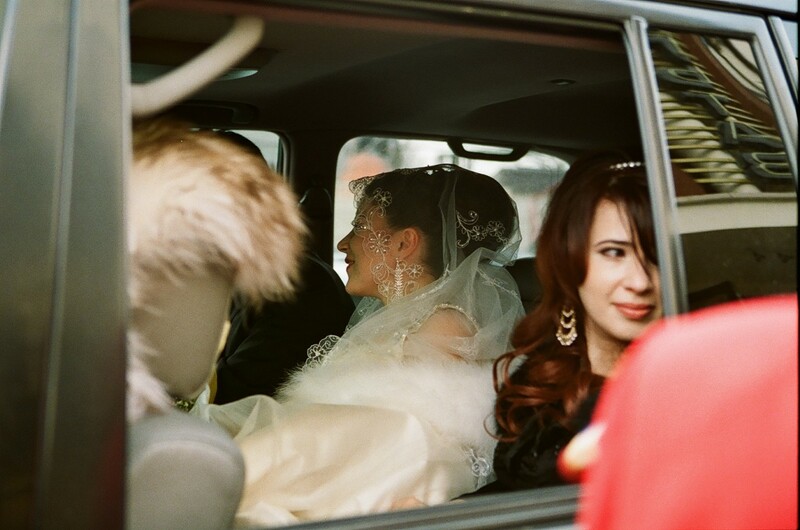 In Dagestan, they carpool to the bride’s village in hopes of kidnapping her. “Whoa! We’re not really going to kidnap anyone, are we?” I asked. Osman, the groom’s cousin, only laughed. Flying through the streets, we talked of wedding customs. This republic in southern Russia, come to find out, has a rich tradition of bride-napping and arranged marriages. I was shocked to learn that the bride, whom we were about to capture, had yet to meet her groom. On the outskirts of Makhachkala, we caught up with the rest of the wedding party. A caravan of nine vehicles was parked on the side of the dusty tarmac, waiting for us. We pulled over, jumped out of Osman’s sleek ride and proceeded to greet the guys, all standing in a circle on the shoulder, some smoking, some eating the customary unsalted, unshelled sunflower seeds. The white Mercedes designated for transporting the bride was decked out with wildflower wreaths and streamers. With shouts of bravado, we slammed our car doors once again and set off in a blaze. During the one-hour journey to the bride’s mountain village, we skirted half a dozen head-on collisions before turning down a clay alleyway toward the bride’s home. Without warning, the wedding party commenced honking their horns, yelling out the windows, jolting and skidding their vehicles to kick up dirt. Then, abruptly, there was an eruption of gunfire. Yes, gunfire. Shotguns, pistols, even an AK-47 were aimed skyward, spraying bullets every which way. As if on cue, Dagestani traditional dance music began to blare from souped-up auto speakers. The fellows emerged from their cars (stopped right in the middle of the village road) and took to dancing the lezginka. The lezginka, the traditional dance of the North Caucasus, features fierce eagle-like undulations with the arms along with rapid footwork and stunning leaps performed with masterful precision. Two guys jumped on top of their vehicles, still dancing. Puffed chests and clenched fists combined with fiery eyes and sharp motions to betray a custom more warrior-like than romancing. Despite the fanfare, we were in and out of the bride’s village in less than thirty minutes. The bride was weeping, out of deference to ritual rather than fear. Per tradition, the bride is supposed to weep upon leaving in order to honor her parents and relatives. The crying bride was decked out in a gorgeous, expensive, veiled, cream-white, Italian wedding dress. The groomsmen plopped her and and two choice female relative representatives into the groom’s oldest brother’s back seat. The acquisition of the bride served only to enflame the passions of our wedding party. Another round of shooting rang out as we departed the village, and another in the center of the nearby mountain town. Passersby barely seemed to take notice. I asked Osman how many weddings he attends each year, and he had a hard time counting. “About fifteen maybe,” he replied. Traffic jams near the capital city forced our wild caravan to jerk into first gear. Our parade slowed, yes, but could not be stopped. We drove on sidewalks, over curbs, through alleyways, and red lights. Onlookers beeped in support or glared with anger as we cut them off unashamedly, nearly ending a few of their lives. A few more gunshots rang into the air as we navigated the narrow streets, finally headed for the large rented wedding hall. But before I could intensify my answer from a polite decline to an adamant refusal, Osman had rung a younger cousin in our caravan. Seconds later, a car pulled parallel to our sedan, and the driver lobbed a loaded gun through my open window. It landed in my lap. I clumsily sandwiched it between my palms. Thankfully, the 9mm Makarov’s safety had been enacted, and the gun kept from discharging during the rough landing on my loins. I held the pistol below the seat, worried that some official on the street might see me, that all the suspicions of my being a spy would become forever justified and result in swift deportation or worse. Foreigners are a rare breed in these parts. One can forgive the local mindset for assuming you must be the latest CIA or MI-6 agent on a James Bond-like mission. At this moment, it sure as heck felt like one. A cousin of Osman’s rushed to my aid. He took the gun and slid the pistol-action into place. I was as red-faced as some of the already-drunk guests. I raised my arm once again, and this time emptied the magazine to the crowd’s thunderous applause. My short volley inspired an instant cacophony of surrounding munitions. Inside the hall, the tables bent beneath the weight of unending courses of boiled lamb, gourmet kebabs, and exotic fruits. Wines, cognacs, and vodkas flowed liberally, although a sizeable number of guests were abstaining, another sign of Islam’s growing influence in Dagestan. During the lezginka, young men landed backflips and perfect triple axels. The women wore exquisite dresses, often a colorful synthesis of a Middle Eastern veiled long skirt with a European cocktail gown, bedecked with heavy, thick-linked golden chains and ornate, silver, saucer-like earrings. Rather than cower in corners or complain about the volume, the deeply revered elders were right in the thick of the action—dancing, feasting, toasting, cheering, shouting—displaying an age-defying, superhuman gusto of the sort legendary civilizations are famous for. It has been said that a culture is only as durable as its institution of marriage. Is it possible that a wedding itself is a barometer of a culture’s health? If so, there may be no stronger society on earth than Dagestan’s. On the comparably quiet, forty-minute drive home, Osman looked over and asked me what was wrong. “I wish,” I told him, “that my own wedding could have been half as celebratory.” His silent stare was unsympathetic. He dropped me back off at my Soviet-style apartment complex. I stood for a moment slightly dazed as the dust settled on the uneven concrete. A Bloody Mary sunset spilled over the pink mountains. A breeze, fresh from over the sea, led a leafless elm in its own lezginka. Dave Hayton is a writer currently living in Dagestan.